Turns out, part of the tension-lever handle assembly includes a die cast piece that was under-engineered for its task. The little ears have little hinge pins that are integral to the casting. They slip into little notches in the frame, against which they pivot. 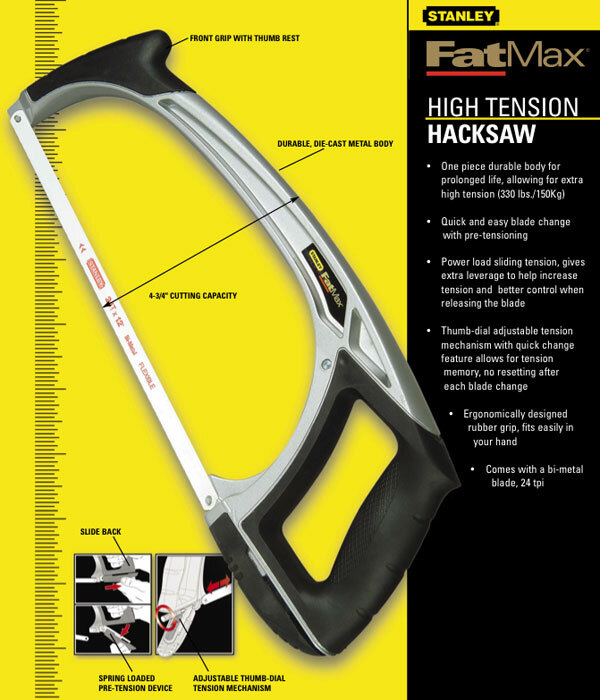 They’re intended to pivot the tension-lever up into the saw, so all the tension on the blade is fed through them. That’s a lot to expect from little nubs of cast metal, and indeed – that was the point of failure. Stanley fatmax lever-handle. The pins on the lower piece sheared off. Those puppies just sheared right off. The pins deformed and snapped out of the handle. I didn’t notice a problem the last time I used the saw. I, perhaps coincidentally, had just changed out a blade, but I used the saw after doing so with no problems. I stored the saw hanging from the frame with the tension left on the blade. When I brought it down to use it again last week, the blade was loose and the pins just fell out. Apparently, the pins finally just let go while the saw was hanging there, doing nothing. I don’t believe that it would have made a difference if I let the tension off the blade when not in use, since I’d have had to crank it good and tight before each use, anyway. Don’t get me wrong. These are cheap tools. I think I paid about $20 for the frame in 2013. I got my money out of it, although I’m disappointed about the failure. 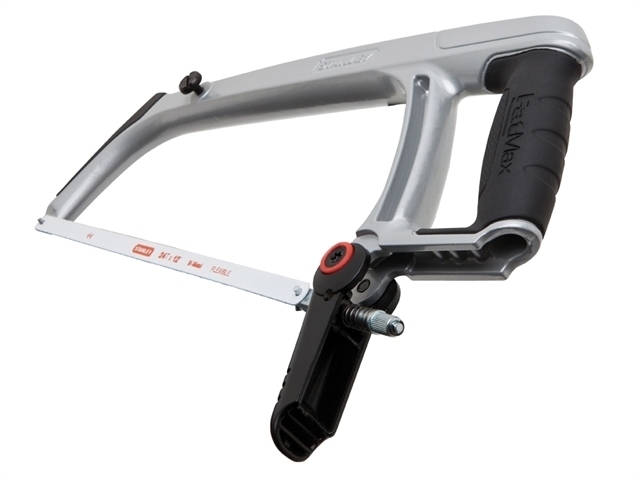 But these saws were actually a pretty robust design (aside from the woeful decision on the tensioner). If they’d made that tension lever a little more skookum, maybe used some hardened steel in that part, they may have lasted longer. 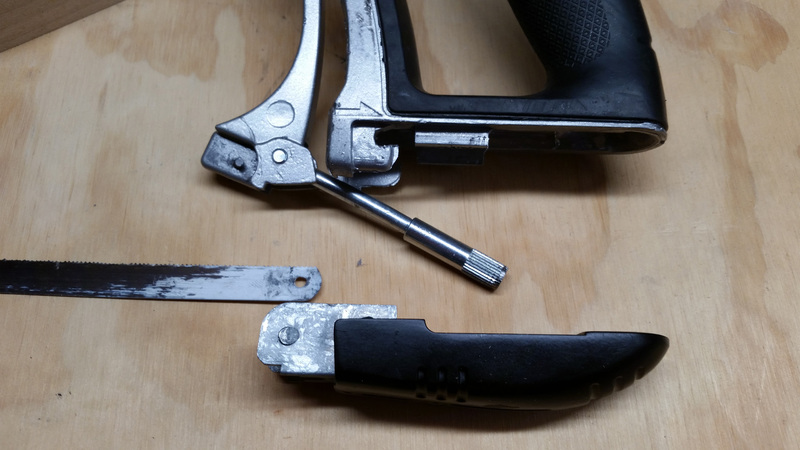 It’s possible my saw’s failure was a fluke, a bad casting, but there’s no real way to tell. To be honest, I always assumed I’d strip the threaded tensioner first. It seemed like the weak point. Guess not. Well! Stop the presses! 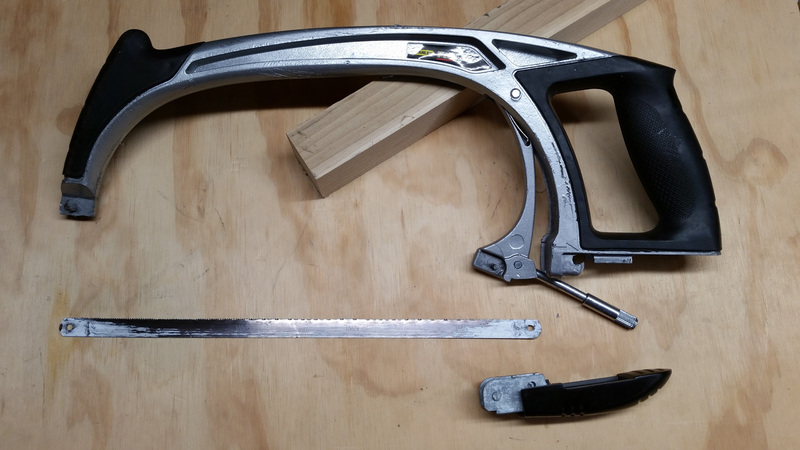 I was scoping out hacksaws while writing this and came across this updated cast-aluminum Stanley Fatmax hacksaw, model 1-20-531, available (as far as I can tell) only in the UK. There’s a yellow version (made in China, I think) model number 20-531 available in the US. It looks like they updated the tension lever to a better design. It appears that on this model, you can replace the pivot pins (well, screws) if and when they break. If the handle is strong enough, that’s probably an improvement. Wish I’d seen this before I replaced my broken hacksaw frame. This is a Stanley Fatmax model 1-20-531, available only from the UK as far as I can detemine. I considered drilling the pins out and trying to engineer a fix out of some small screws set in drilled and tapped holes. I might still try just for fun. (A through-pin would interfere with the threaded tensioner rod.) Instead, I ended up just ordering a new old stock replacement hacksaw off ebay. If I get more than three years out of it, I’ll be happy enough (it only cost $25). Hopefully it will last longer. I thought about buying a Lenox frame, which comes with good recommendations on garagejournal, but I believe they’re currently made in China, and I preferred the single-piece construction of the Stanley. Now I wish I’d bought that UK version instead of the older Fatmax, but I’ll have to wait and see how the replacement performs. 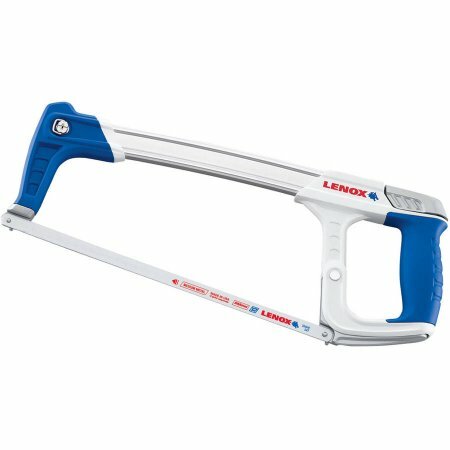 Lenox hacksaw frame. Comes recommended at garagejournal, but I think it is made in China. By the way, the Stanley fatmax model I discussed in this post was a now-discontinued version of the 20-531. I think they kept the model number on the yellow 20-531, but it is made in China, not the USA. Oh yeah, I like Lenox brand hacksaw blades. They’re currently made in the USA, although I understand that may be changing in the near future. Oh yeah (some more), did I mention that these hacksaws are Ron Swanson approved? 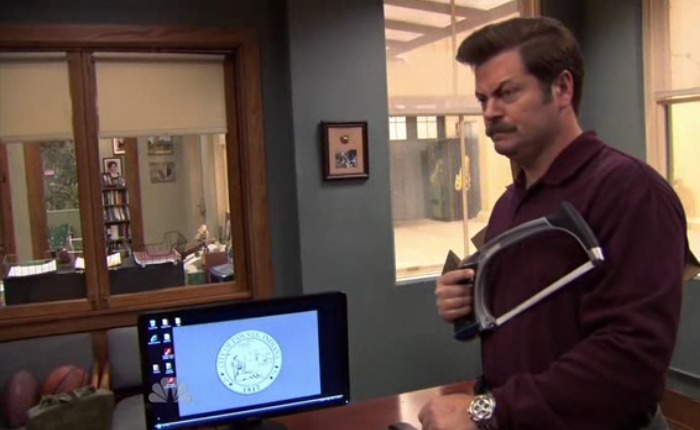 Or is Ron’s expression due to the pins shearing off on his hacksaw, too? Don’t bother with the newer 20-531 hacksaw their junk! 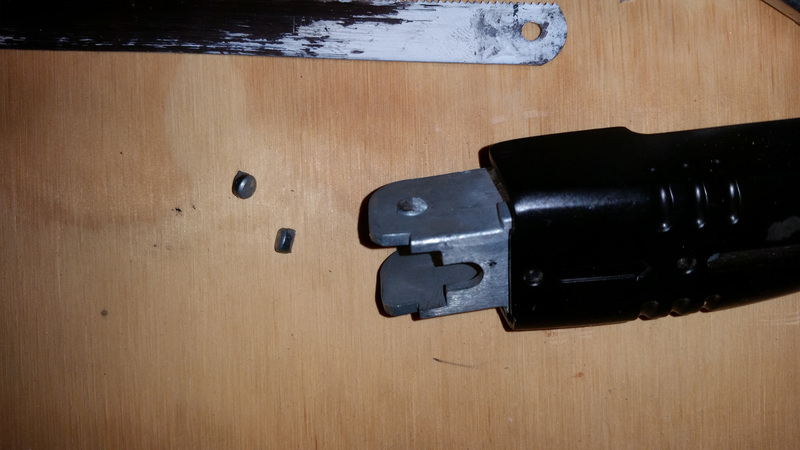 The first one I had lasted a month before the frame snapped in two the one I replaced it with would not hold the blade straight and the dealt 5 in 1 I “upgraded ” to failed when the die cast aluminium tension lever fell to bits. Get an Mk Morsels master McCoy high tension frame. Job done. I’m looking at your blog February 24, 2018, and at my 20-531 hack saw which failed exactly as you experience. An apprentice had borrowed it, and then much later I discovered the problem. Taking the high road: as in your case, can’t be sure what caused it to fail. I’ve had mine perhaps 8 years. Did you ever work out a fix for those sheared nubs? Would love to make the saw work again, some how. Thanks for visiting. I don’t think there is a sufficient repair option for the sheared pins. 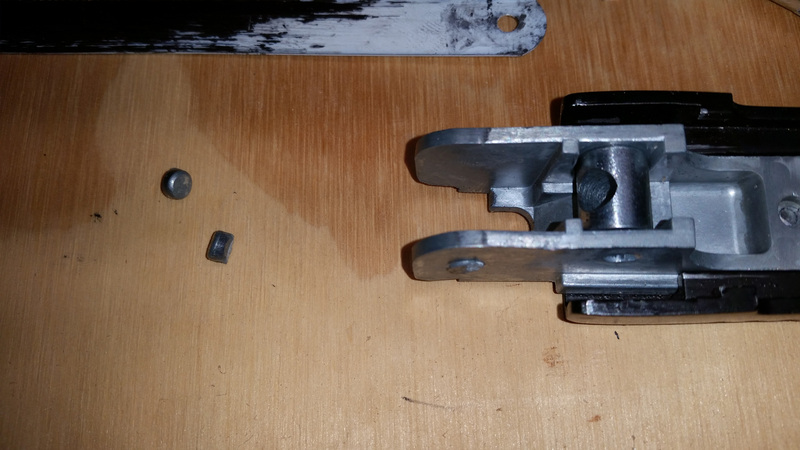 You can’t stick a pin through the entire part, because it would interfere with the operation of the tensioner. I wish it could be fixed, but I think it’s ultimately a design flaw. They’re nice saws, otherwise!